Chest drains and pleural aspirations represent a colorful medical mosaic in which many variables are involved: experience and training of the proceduralist, the indication for the procedure, the type of procedure, the duration of treatment, the quality of the effusion, drain management, the setting in which the procedure is done, and the most important aspect- the patient. Bae JM. Life threatening hemoperitoneum and liver injury as a result of chest tube thoracostomy. Clin Med Insights. Case reports 2001;8:15–7. PMC [article] PMCID: PMC4345926, PMID: 25780345. doi: 10.4137/CCRep.S23139. Baird R, Al-Balushi Z, Wackett J, Bouchard S. Iatrogenic Horner syndrome after tube thoracostomy. J Pediatr Surg. 2009;44(10):2012–4. doi: 10.1016/j.jpedsurg.2009.05.022. PubMed [citation] PMID: 19853764. Cardozo S, Belgrave K. A shocking complication of a pneumothorax: chest tube-induced arrhythmias and review of the literature. Case Rep Cardiol. 2014;2014:681572. doi: 10.1155/2014/681572. Epub 2014 Jul 24. PubMed [citation] PMID: 25147742, PMCID: PMC4131458. Goltz JP, Gorski A, Böhler J, Kickuth R, Hahn D, Ritter CO. Iatrogenic perforation of the left heart during placement of a chest drain. Diagn Interv Radiol. 2011;17(3):229–31. doi: 10.4261/1305-3825.DIR.3131-09.0. Epub 2010 Aug 3. PubMed [citation] PMID: 20683819. Harris A, O’Driscoll BR, Turkington PM. Survey of major complications of intercostal chest drain insertion in the UK. Postgrad Med J. 2010;86(1012):68–72. doi: 10.1136/pgmj.2009.087759. PubMed [citation] PMID: 20145053. Havelock T, Teoh R, Laws D, Gleeson F, BTS Pleural Disease Guideline Group. Pleural procedures and thoracic ultrasound: British Thoracic Society Pleural Disease Guideline 2010. Thorax. 2010;65(Suppl 2):ii61–76. doi: 10.1136/thx.2010.137026. No abstract available. PubMed [citation] PMID: 20696688. Hibbert B, Lim TW, Hibbert R, Green M, Gollob MH, Davis DR. Ventricular tachycardia following tube thoracotomy. Europace. 2010;12(10):1504–6. doi: 10.1093/europace/euq172. Epub 2010 Jun 4. PubMed [citation] PMID: 20525725. Iaci G, Castiglioni A, Fumero A, Carlino M, Margonato A, Alfieri O. Resolution of an acute cardiac ischemia after the removal of a surgical drain in mitral and tricuspid valve repair. Ann Thorac Surg. 2011;91(6):e94. doi: 10.1016/j.athoracsur.2011.03.018. No abstract available. PubMed [citation] PMID: 21619958. Jeon EY, Cho YK, Yoon DY, Seo YL, Lim KJ, Yun EJ. Angiographic analysis of the lateral intercostal artery perforator of the posterior intercostal artery: anatomic variation and clinical significance. Diagn Interv Radiol. 2015;21(5):415–8. PMC [article] PMCID: PMC4557326, PMID: 26268302. doi: 10.5152/dir.2015.15096. 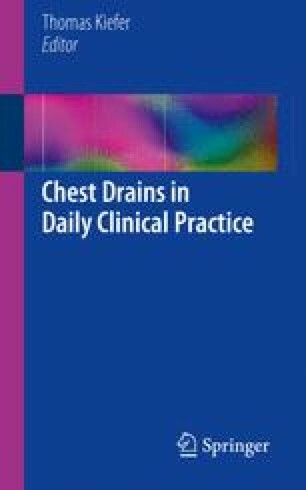 John M, Razi S, Sainathan S, Stavropoulos C. Is the trocar technique for tube thoracostomy safe in the current era? Interact Cardiovasc Thorac Surg. 2014;19(1):125–8. doi: 10.1093/icvts/ivu071. Epub 2014 Mar 19. Review. PubMed [citation] PMID: 24648468. Kim D, Lim SH, Seo PW. Iatrogenic perforation of the left ventricle during insertion of a chest drain. Korean J Thorac Cardiovasc Surg. 2013;46(3):223–5. doi: 10.5090/kjtcs.2013.46.3.223. Epub 2013 Jun 5. PubMed [citation] PMID: 23772413, PMCID: PMC3680611. Limsukon A, Yick D, Kamangar N. Chylothorax: a rare complication of tube thoracostomy. J Emerg Med. 2011;40(3):280–2. doi: 10.1016/j.jemermed.2007.12.023. Epub 2008 Aug 30. PubMed [citation] PMID: 18757158. Maybauer MO, Geisser W, Wolff H, Maybauer DM. Incidence and outcome of tube thoracostomy positioning in trauma patients. Prehosp Emerg Care. 2012;16(2):237–41. doi: 10.3109/10903127.2011.615975. Epub 2011 Oct 3. PubMed [citation] PMID: 21967410. Paul AO, Kirchhoff C, Kay MV, Hiebl A, Koerner M, Braunstein VA, Mutschler W, Kanz KG. Malfunction of a Heimlich flutter valve causing tension pneumothorax: case report of a rare complication. Patient Saf Surg. 2010;4(1):8. doi: 10.1186/1754-9493-4-8. PubMed [citation] PMID: 20565768, PMCID: PMC2901307. Seki M, Yoda S. Unexpected massive hemorrhage following the removal of a pleural drainage tube. Intern Med. 2015;54(8):953–4. doi: 10.2169/internalmedicine.54.3719. Epub 2015 Apr 15. PubMed [citation] PMID: 25876579. Shojaee S, Argento AC. Ultrasound-guided pleural access. Semin Respir Crit Care Med. 2014;35(6):693–705. doi: 10.1055/s-0034-1395794. Epub 2014 Dec 2. Review. PubMed [citation] PMID: 25463160. Sundaramurthy SR, Moshinsky RA, Smith JA. Non-operative management of tube thoracostomy induced pulmonary artery injury. Interact Cardiovasc Thorac Surg. 2009;9(4):759–60. doi: 10.1510/icvts.2009.209262. Epub 2009 Jul 31. PubMed [citation] PMID: 19648149. Tait P, Waheed U, Bell S. Successful removal of malpositioned chest drain within the liver by embolization of the transhepatic track. Cardiovasc Intervent Radiol. 2009;32(4):825–7. doi: 10.1007/s00270-008-9461-y. Epub 2008 Oct 30. PubMed [citation] PMID: 18972157. Yen CC, Yang YS, Liu KY. Aortic perforation caused by friction of a chest tube after coronary artery bypass surgery. Heart Surg Forum. 2010;13(3):E159–60. doi: 10.1532/HSF98.20091165. PubMed [citation] PMID: 20534415.